Tufted Apple Budmoth (TABM): The first tufted apple budmoth adults were caught on 5/1 in southern counties. The first insecticides that target this pest will be due in a few weeks in southern counties. This has been only a minor pest during the last 6-8 years. Plum Curculio (PC): We are entering the period of peak of PC activity in all areas of the state. If significant rains follow insecticide applications, then re-apply with effective materials after an inch or more of precipitation. Do not rely on pyrethroids for control, especially in hot weather. Avaunt, Imidan (phosmet), provide the best control. The neonics, Actara, Belay and Calypso also work well, but should not be used with weedy groundcovers to protect bees. Tarnished Plant Bugs and Other Catfacing Insects: This is the other key insect complex at this time of year. Tarnished plant bugs will become more of an issue as temperatures warm and mowing and other ground cover activities become more common. General spray timing at this time of year should still be targeted for Plum Curculio (PC). Most materials, except the diamides (Altacor, Belt, Tourismo) used for these pests will have some efficacy for plant bugs. Mating disruption of Lesser and Greater Peach Tree Borers: Growers in New Jersey who have been using or want to start using mating disruption for borer control and have not put dispensers in orchards should have already placed Isomate® PTB Dual Dispensers @ 150/acre. For details of deploying dispensers refer to the product label. 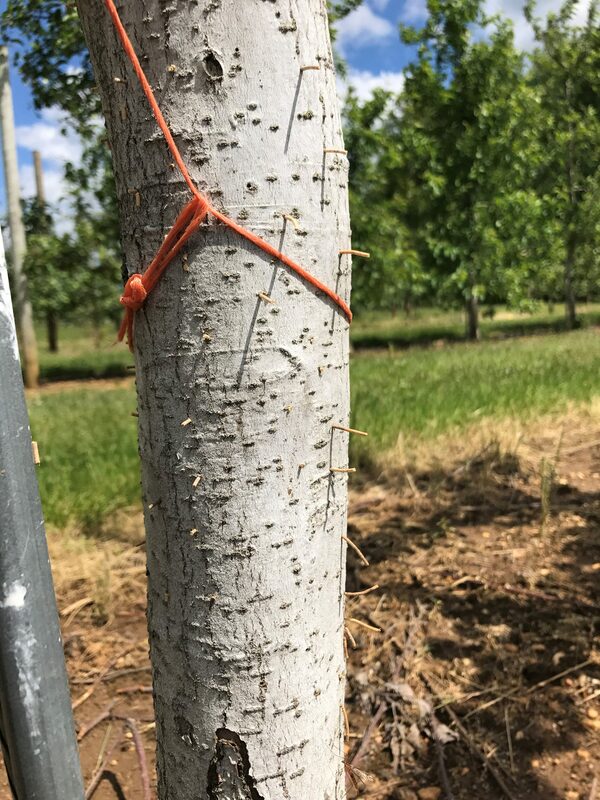 If you have cherry or plum orchards or isolated trees close to peaches and nectarines you should provide mating disruption of those trees, too. Bacterial Spot: Copper formulations should be used starting now to suppress bacterial spot. Generally we recommend starting at 0.5 ozs metallic copper and gradually lowering the rate as the season progresses. The rate applied will depend on the formulation. Dr. Lalancette published a chart listing common copper formulations and rates for peach and nectarine applications. Avoid combining copper with captan especially if it has been overcast for several days. Also avoid acidic spray solutions when applying copper. Mycoshield may also be used at 1-1.5#/acre. It is more rainfast than copper but has a short residual. Peach Scab: In addition to Rusty Spot and Bacterial Spot, peach scab requires protective applications at this time. Topsin/Captan or Topsin/Sulfur combinations are general used in cover sprays where scab was a problem last year. Captan or Sulfur alone is sufficient in orchards that were clean last year. Rusty Spot: An effective material should be included at petal fall, and continue through 2nd cover on rusty spot sensitive varieties. Rally at 2.5 – 5 oz./acre is the standard product used in cover sprays. Codling Moth (CM): The first codling moth flight has started. A biofix was set for CM on April 26 in southern counties, and on May 2 in northern counties. Diseases: Apple Scab, Powdery Mildew, Cedar Apple Rust, are diseases of concern at this time. The NEWA scab models are predicting about 100% ascospore maturity during this period in southern NJ and about 90% maturity in Hunterdon County. Primary apple scab spores are released during any substantial wetting and infection period. Cedar apple rust infections can occur anytime between pink and 3rd cover. Fire Blight: A few orchards have low to moderate levels of strikes present. Sanitation is important both to remove inoculum and help to bitter rot inoculum buildup. Instructions for deciding when and how to cut out fire blight strikes can be found on page 7 of the UMASS bulletin, “An Annual Program for Fire blight Management”. “Toothpicks” emerging from Ambrosia Beetle tunnels. Ambrosia Beetle: Ambrosia beetle has been active this past week in apples, pears and, plums. Ambrosia beetles usually attack stressed trees and will congregate in areas surrounding the infested tree. Infestations can be identified by sap weeping from tiny holes where the female has gone in, or more typically by the presence of “tooth picks” which is sawdust pushing out from entry holes (see picture at right). As the female tunnels in she spreads a fungus that infects the tree providing a food source for the larvae that will hatch from the eggs laid in galleries she creates. The fungus weakens the tree and in some cases kills it. We have no control recommendations for this destructive pest other than removal and burning of infested scaffolds and trunks. 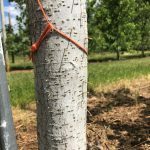 Mating disruption for Dogwood Borer Control: Dogwood borers start flying in May and dispensers should be deployed before first recorded adults in pheromone traps. Recommended rate is 100 – 150 Isomate DWB dispensers per acre as per the label. Pear Psylla : Pear Psylla adults are still laying eggs for the second generation of nymphs. Control of this generation is important to avoid overlapping generations throughout the summer. Scout the growing tips for eggs. Eggs are usually laid along the center leaf rib mostly on the leaf underside. Applications of 1 % summer oil in early cover sprays have shown to be of benefit. Use oils and adjuvants with caution on Asian varieties. When applying insecticides for psylla control timing is important as materials such as Movento and Agrimek should be applied when the first eggs hatch. In the case of Movento application a few days before hatch is better as this material takes some time to move into the tissue. Add penetrants as per label instructions. Neonicotinoids may also applied when the first eggs hatch. The addition of 1 qt. summer oil or a non-ionic surfactant will improve control with these materials. Finally Sivanto, a chemistry closely related to neonicotinoids is effective but should be used with oil as per label instructions. Some miticides such as Portal and Nexter are effective, but should be applied when most eggs have hatched but before any nymphs begin to form wings.